How do you think about the causes of the setbacks, both small and not-so-small, that happen to you? In his book Learned Optimism, Martin Seligman makes a case for the idea that people who resist helplessness believe the causes of bad events are temporary. 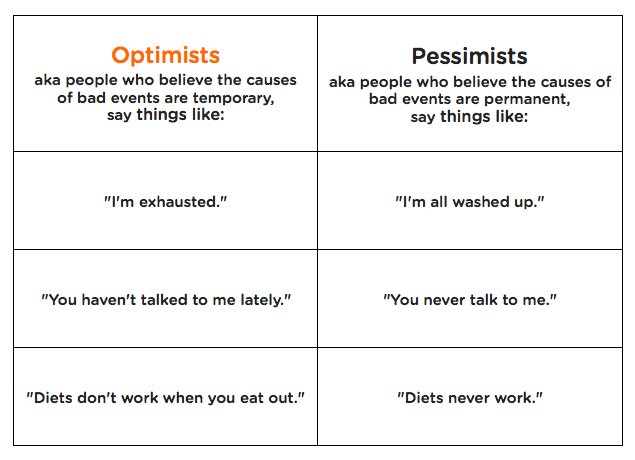 Those people tend to be optimistic, while the people who believe the causes of bad events, even minor ones, are permanent tend to be pessimistic. How can you know who’s who? :) Martin gives us a few of examples of things people from each group tend to habitually say when they are experiencing a setback. Click here to see them. Moral of the story: don’t join those who habitually think about bad things in terms of ‘always’ and ‘never.’ Resilience is a choice, not an inherited characteristic like your height or the colour of your eyes. It’s easy to forget that.